Put down the kibble, Fido. Animal Planet has ordered the My Fat Pet TV series, to premiere in the third quarter of 2017. Hosted by Travis Brorsen, the new docu-series features overfed and under-exercised pets. Brorsen will work with owners to get their animals into a healthy lifestyle. Learn more about the My Fat Pet TV show from this Animal Planet press release. Who hasn’t laughed at a shared internet video of a cat trying to fit through a cat door? 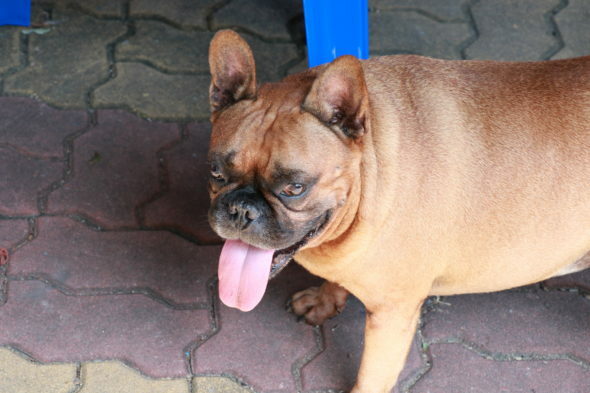 But the unfortunate truth is that the U.S. pet overweight and obesity rate for dogs and cats is more than 50%, mostly the result of being overfed and not getting enough exercise. In Animal Planet’s all-new series MY FAT PET, animal expert and trainer Travis Brorsen works with pets and their owners through a four-month long weight-loss journey. MY FAT PET premieres on Animal Planet in 3Q17. Obese animals are more than likely to experience high blood pressure, diabetes and heart failure, thus leading to a shorter life. In MY FAT PET, audiences are introduced to families and their pets that require an immediate intervention. Brorsen creates individual exercise and diet plans for the families to follow in addition to scheduling appointments with a veterinarian. He uses creative techniques as wake-up calls for the owners, using visual experiments that let them experience what their pets are going through. As an example, one owner is forced to wear a weighted vest to experience the extra weight their family dog is carrying around due to being overweight. After tasking the owners with a four-month period to work with their pets, Brorsen returns for the final weigh-in to see just how far both the owners and the pets have come. Can Brorsen help families realize how dire the situations are with their overweight pets? Will the animal owners learn how to properly feed and exercise their pets? While every result may be different, Brorsen’s goal is to help each family keep up with their new-found routines which will help their pets live a healthier and longer life. MY FAT PET is produced for Animal Planet by Castleview Productions. For Castleview Productions, Ted Barnhill and Jessica E. Reynolds are executive producers. For Animal Planet, Keith Hoffman is executive producer and Sarah Russell is producer. What do you think? Will you check out the My Fat Pet TV series? Let us know, below. More about: Animal Planet TV shows: canceled or renewed?, My Fat Pet, My Fat Pet: canceled or renewed? Please help me with advice and anything you can suggest my cats Sylk and Pip, 10 and 4 years-olds. How do I submit an application for this show? My mother has four obese chihuahuas, one is almost unable to walk due to his obesity and luxating patellas. Basically his knees pop out of his sockets when he walks, making it hard to exercise. HELP! I will watch. Please help me and my dog, Trixie. She is a great pet and would become a star. Please help us. Please renew it. I want to watch it and I want to get my pet Trixie on it. She would be an instant store. Please help me. Thank you very much.